On today’s episode of Steal the Show, we are discussing talk triggers: the things that brands and businesses do that get us telling stories about them to our friends. However, to create one inside our own company is much easier said than done. That’s why we’re digging into the specific elements required for a talk trigger to be activated. With so much noise in the marketing and advertising spaces, the opportunity to set yourself apart from the competition lies in the customer experience. Listen to this episode to understand the anatomy of a talk trigger, so you can implement them into your brand experience! Most of those who are good at word-of-mouth are good at it by accident. Talk triggers must align with the brand’s positioning and be operationally feasible. It is most difficult for companies to operationalize human interaction. Look at UberConference’s hold music as an example of a talk trigger. 00:00 Daniel Lemin : Jay’s talk trigger is that when he finishes fixing your locks, he does a security audit of your home and then oils every lock, door and window in your home, regardless of which one he worked on. He does both of those things for free. That makes sense, though, because he’s a locksmith. 00:38 Michael Port: Hello gentlemen. 00:39 Jay Baer: Hello Michael, thank you so much for having us here. 00:41 Daniel Lemin: Hello, hello, hello! We are delighted to be here! Both of us are delighted to be here! 00:45 Michael Port: You know, I don’t usually get to do a podcast with two people, and I’m excited to do it, because the greatest thing about the podcasts that I do, is that most of the people who are on the podcast are professional speakers. Which means I can say, “Hi!” and then stop talking for sixty minutes, then they go. I do have a quite a list of questions for you. I want to start with, I think, the most important question, it’s a more serious question, and I think it’s something that we need to consider very seriously. I think it may be possible, it may be the case that you are the first people, certainly in the business space, to feature an Alpaca on the cover of the book. 01:33 Jay Baer: Okay, that’s all Daniel, 100% Daniel Lemin. We had a cover from our publisher, which was not good – and I’m trying to measure my responses here as best as I can – and Daniel, in his extraordinary skill set, just kind of said, “Hey, here’s one that would be funny,” and here we are. 01:58 Daniel Lemin: Yeah, that’s pretty much how it happened, I mean the funny thing about that, there was an entire body, like a collection of Alpaca photo’s for us to choose from, which, kind of was a surprise to us. Like, there’s a whole body of work about Alpacas, talking to each other. So, that’s pretty much how it happened. 02:16 Michael Port: But, in all seriousness, I think we can look at your cover, as an example of a talk trigger. So, I’d like you to start with the definition of a talk trigger, and how the choices you made on the cover, illustrate this. 02:32 Jay Baer: Sure, I mean, somebody told us this, once, to make choices and raise the stakes and so we tried to do that with the book itself. A talk trigger is a strategic operational choice that you make in your business or in your life, an operational decision that you make, that compels word of mouth. One of the challenges that we find now, is that ‘same is lame’. I don’t know everybody listening, but I definitely know some of your listeners, Michael. But I do know this for a fact, nobody listening right now has ever said, “Let me tell you about this perfectly adequate experience that I just had,” or, “this perfectly adequate speech,” or, “This perfectly adequate book,” but yet, in business we tend to play follow the leader all the time. We look for best practices and say who’s good and let’s try and mimic them, and that never really works. And so, what we discovered in the research that we did for this book and also in our consulting practice, is that those who have the courage to do things distinctly and purposefully and strategically different, will reap the rewards and those rewards come from customers telling that story to other customers, and you acquire new customers for free. So we have to make it look different, and talk different. Daniel can tell you about a couple of the talk triggers that we have in addition to the cover. 03:58 Michael Port: So what must be true, for a differentiator to be a talk trigger? 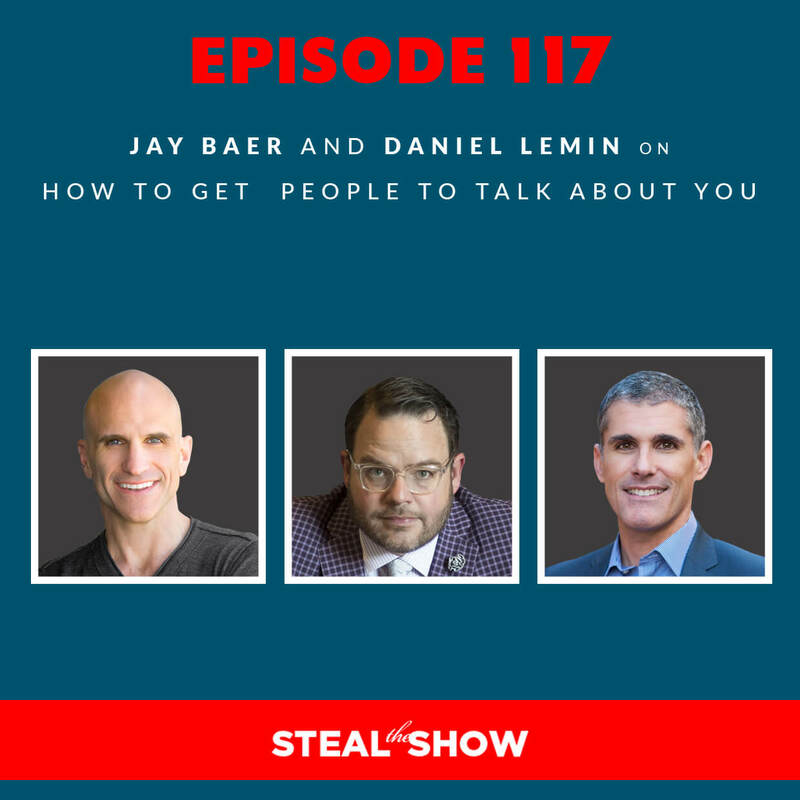 04:04 Daniel Lemin: There are four things, really, and they’re not mutually exclusive things, so when you look at the talk triggers that seem to be working in the marketplace, there are lots of examples in all industries. When you go to a Double Tree Hotel, if you’ve ever stayed in one, you’ll know, when you check in, they give you, what? A chocolate chip cookie. It’s a cookie, right? It’s not a unicorn, it’s not an island; they give you a cookie. And it’s really the first rule of talk triggers, there are four things that have to be true for something to be talkable or talk-worthy. The first is that is has to be remarkable. Something remarkable. If you checked in and they gave you a free room upgrade, that might be also great, but it’s not exactly something you talk about. 04:49 Michael Port: It’s sort of similar to what our friend, Sally Hogshead, brought to our conference. We were both at a conference this weekend, it was about 2,500 people and she had given out 2,500 miniature, tiny little, hands the you put on your finger. It’s the creepiest thing I’ve ever seen, it’s so perfect. So that’s the kind of thing that you’re talking about. 05:12 Jay Baer: Yeah, and, in fact, we actually interviewed Sally in the book, in our book, ‘Talk Triggers’, about some of her ideas around fascination and different being better than better. She’s exactly right. What we’ve tried to do in the book, is add a real system for how to do this. So, the four things that must be true for a differentiator to be a talk trigger, and the five types of talk triggers, and then a very viable, proven, six-step process where anybody with a business, a speaker, can actually create their own talk trigger. So, we’ve actually tried to take the field of word of mouth, which has been around since the first caveman sold a rock to another caveman, and add some structure and discipline around it. The challenge is, most people who are “good” at word of mouth, are good at it by accident. What we’re trying to do is help them be good at it on purpose. 05:56 Michael Port: So, the first differentiator is ‘remarkable’. There needs to be something different about it that incites people to remark on the thing that you’ve put into the customer journey at some place. So what’s number two? 06:14 Daniel Lemin: Well, it has to be repeatable. So, it’s not something that you only get on Friday, that only customers who pay you a particular amount of money get, it’s all of them. Every customer, every single time. So that’s the second of the two. And that’s really important, because it differentiates what could be stunts or gimmicks from actual talk triggers. If it’s something that not everybody gets access to, you’re actually creating the enemy of word of mouth, you’re creating some anger and angst by making it exclusive. And that is a huge difference. 06:44 Michael Port: So, I get that idea of making sure that everybody is included in that process, of getting that thing that creates the talk trigger. What if you have different levels of customers, and different types of offerings? So that, you know, if we’re doing something that costs $100,000 and is very comprehensive and is very high touch, the experience those customers have should be different than the experience that a customer had when they bought a $100 product online, that was, say, a series of videos. So, can you have different talk triggers for different types of offerings? What should be consistent across the board, and what can be unique to the thing that you’re selling, that you’re offering? 07:25 Jay Baer: I think you can. As a practical matter, we don’t often see brands with multiple talk triggers, because it can create some story confusion. If the idea is you want you customers to tell a story to another set of customers, if there’s a lot of different stories flying around, unless they’re very symbiotic in terms of kind of what they say about your brand, it can get a little confusing. There’s no reason why you couldn’t do it that way, and it’s especially applicable if the different customer types that you’ve articulated, tend to stay separate. So, the folks who are kind of in category platinum, are really unlikely to mix and mingle with category aluminium, if that’s the case then I think it’s perfectly acceptable to have multiple talk triggers, one for each customer segment. But, generally speaking, it’s one per brand or per organisation. 08:17 Michael Port: So, they’ll have different experiences, but the concept of the talk trigger, you are encouraging us to think about it as something that is specific across the board, that can spread the message of your brand in some way that everybody can consume it. You know, when I say everybody, I mean your target audience, the people you are trying to reach. 08:42 Michael Port: So, number one, was that it needs to be remarkable, number two is that it should not be exclusive, it should be consistent across the board. 08:50 Daniel Lemin: Repeatable, we call it. 08:53 Jay Baer: Yeah, repeatable. The third one is, it needs to be relevant. And you were just talking about this. This is this idea that if you’re going to have a talk trigger, a strategic operational differentiator, it needs to make sense in the context of who you are and what you do. So, Daniel mentioned the Double Tree by Hilton example. They give out 75,000 warm, chocolate chip cookies every day. There’s an example in the book, a case study of a guy whose name is Jay Sofer. He’s a locksmith, in New York City. He’s the highest rated locksmith in New York City, on Yelp. He’s one of the highest rated businesses in New York City, of any kind, on Yelp, which is a remarkable accomplishment. Jay’s talk trigger is that, when he finishes fixing your locks, he does a security audit of your home and then oils every lock, door and window in your home, regardless of which one he worked on. He does both of those things for free. That’s an extraordinary talk trigger, like, “Man, this guy did all this extra work for nothing!” It’s a propellant for his business. That makes sense, though, because he’s a locksmith. You’re like, “Uhm… Probably not, actually, no. I’ve never had a locksmith cookie, and that’s probably not a thing I want to get into.” So, you’ve got to understand. So there are fourteen brands in the Hilton portfolio. Of all of those brands, Double Tree’s actual brand positioning – by mote admission, we interviewed their CMO for the book – their positioning is ‘the warm welcome’. They put a tremendous amount of time, effort, training, resources, into ten minutes, from the time you walk over the threshold of the hotel, until the time you walk over the threshold of our room. They want to own those ten minutes. So they train their staff more than most, they have a nicer lobby than most, and the cookie ceremony, the “here is your warm chocolate chip cookie”, which is almost like a tea ceremony, that’s part of the warm welcome, and it makes sense. So, the talk trigger has to be relevant. It’s no just about attention, it’s about a story that your customers tell one another, and that story has to add up cognitively. 10:57 Michael Port: Hmmm. Yeah, and so, I was just thinking about an experience I had this past week at a hotel in Toronto. Amy and I produced a running joke throughout the time we were there, because we were just waiting for one of the doormen to actually open one of the doors. When we attempted to walk through them, carrying grocery bags, or luggage, and we did not succeed. We were there for four days, and there was not one time a doorman actually moved his feet and walked over to help, and when I say. Maybe three or four feet away, not doing anything, just standing there. So, I started to think, “Wait a minute. Maybe their doormen don’t open doors.” You know? I’ve heard of cleaning people who say, “I don’t do windows.” Okay, so maybe these doormen don’t do doors. But then I did think that the door man and the door are very closely affiliated, so you would think that would be the primary function of the position. 11:53 Jay Baer: Yes! It’s in the name of the job! You had one job! Now I bet a really clever marketer could actually turn that into something that would work for them. Right now, what they’ve got, is the assumption they’re supposed to open it, and then they don’t. And then, of course, you’re disappointed. But what if, at a high end hotel like this, I heard, in advance, “They don’t open the doors. There’s this thing that they do where they don’t open the doors, you got to check it out!” Could something that seems like a negative, actually be turned into a positive? But you absolutely could play that card. It would require some operational vigilance and require a disproportionate amount of cheekiness, but yes, you could absolutely do it, it would be great. 13:10 Michael Port: I love that kind of cheekiness, frankly, in a hotel. Or, it could be the reverse. They have sprinting doormen. These doormen, like, they wear tracksuits, and they run, really, really fast, and they run to the door really fast, and they run back to where they were. Well, now you’ve got some other kind of talk trigger. Yeah, I get that, I like that. 13:33 Jay Baer: That’s why this is such a fun book and such a fun world to work in, all this word of mouth consulting that we’re doing now. It’s just a blast, where I can say, “Okay, let’s come up with things that people are going to talk about,” but doing it with some structure and some academic rigour. So, it’s not just sitting around a table with tequila and coming up with some random ideas, right? There’s actually a process for figuring this out. It’s just really been super gratifying. 14:00 Michael Port: That’s fantastic! Do you find that some of these companies that you’re working with get so excited about all the talk trigger ideas that they come up with, that they want to implement all of them, so they have, “Oh! We’ve got 32 new talk triggers!” But, really, what are you looking to do? When you do this kind of work? So, brainstorming a talk trigger is probably not the best way to do it. The process that we talk about in the book and that we use, day to day, now, in our consulting industry, is to really go deep on understanding, at every stage of the customer’s journey, what your customers expect from you. Because once you’ve documented what they expect, you can then figure out what they don’t expect. And what they don’t expect is the raw materials for the talk trigger. So, we recommend doing a series of interviews, so you interview new customers, old customers and lost customers. You mine the attitudes of your sales department, you mine the attitudes of your customer service department. We call that the triangle of awesome, in the book, which is marketing plus sales plus service. So, really doing the work, ahead of time, to say, “Where are we at? What’s the baseline here?” and then going well above that baseline in what are more customer touch points? 15:25 Michael Port: So, number one was remarkable, in terms of, “How do you make a talk trigger a real differentiator?”; what must be true for a differentiator to be a talk trigger, is, I think, perhaps a better way to state it. So, number two was that it needs to be repeatable, three is relevant, and what about number four? Or, if you show up at the room, and there’s a baby alpaca waiting for you to cuddle with. 16:24 Michael Port: People will talk about it! 16:27 Daniel Lemin: Yeah, for sure! 16:28 Michael Port: The alpaca may or may not be repeatable. You’d probably have to go through a lot of alpacas. 16:34 Daniel Lemin: Yeah, well, and I can say, from personal experience, Jay too, with the alpacas, they actually don’t smell super great, so it might generate some negativity. 16;43 Michael Port: So, then the relevancy, of course, is critical, and in that case the alpaca probably is not relevant to most people checking into a hotel. And then the fourth is, it’s got to be reasonable. 16:54 Jay Baer: Yeah, because the thing is, when you deliver something in an experience or a differentiator that’s too grand, it actually has an opposite effect, Michael. So, what happens, is people aren’t talking about your differentiator, they’re talking about your terms and conditions. So, what you’re looking for in your talk trigger, is the Goldilocks zone. Something that’s different enough to be talkable, but not so big that it is untrustworthy. That’s why the Double Tree example is so interesting, right? It’s just a chocolate chip cookie, it’s just a cookie. But our research suggests that 34% of their customers have talked about that cookie, without being asked, in the last 60 days. So when you do the math on that it’s about 25,500 per day talking about the cookie. Which is one of the many reasons why, the last time you saw a Double Tree ad, is probably never. And you go, “Wow, that’s great! I love that, but actually, I’d like that every time,” so, it highlights the policy, which actually may put it in an even more negative light. 19:07 Jay Baer: Yes, it’s so big that you start wondering about the terms and conditions, and it also violates the repeatable clause, which is, it’s circumstantial. And when you treat customers circumstantially, you are asking for trouble. Now, there’s a huge, a lot of marketers now try to rely on surprise and delight, and doing something really extraordinary for a particular customer in a particular circumstance. And surprise and delight is fine, I don’t have a problem with it, but it’s a lottery ticket, it’s not a word of mouth strategy. A talk trigger, and surprise and delight are not the same thing. Surprise and delight is a hail Mary, talk trigger works every single day. 19:41 Michael Port: And surprise and delight is often you get these unintended benefits from the surprise and delight. Sometimes you just delight someone or surprise somebody because as you serve your customers you get an idea in a moment that delights them and surprises them, but it’s not something you repeat, or can repeat. 20:00 Daniel Lemin: Yeah, it’s not scalable, typically. 20:02 Michael Port: Exactly right, so, I had a question of something going through my mind just a second ago which I wanted to ask you, and I want to bring it back, but I don’t remember it at the moment. So, it’ll come back to me. It’ll definitely come back to me, because it was an important one. While we’re waiting for that to come back to me, I’m wondering, for our speakers, what would be a talk trigger in a speech? 20:29 Daniel Lemin: A lot of the examples we’ve looked at here, are giving away of things, like free cookie, oiling of your locks, but there’s a whole other way of looking at talk triggers where part of the customer experience is the talk trigger, not necessarily the thing that’s given extra at the end. So, I mean, just, if you’ve seen Jay speak, he wears amazing suits and always looks fantastic on stage. And that’s a talk trigger. It becomes a part of the experience at one of his engagements. So, the way you look, for a speaker, could be a talk trigger. 21:02 Jay Baer: And also, what you do on stage. So, you look at Toni Newman, for example. Toni Newman is a terrific speaker. She has a big segment of her programs about a red ladder, and the idea is that, as you scale the ladder, you’ve got a better vision for your business, and that when you get up on high, you can get to see the moves you need to make in your company. She actually travels with a red ladder, and uses the red ladder in every single program, and then after the program, gives the meeting planner who booked her, a miniature red ladder and asks them to take a picture of it in some unique location and put it on social media and hashtag it. And so, the chances of me travelling around the world carrying my own red ladder, is 0%, God bless her, that’s a lot of logistics! But it’s a terrific talk trigger. 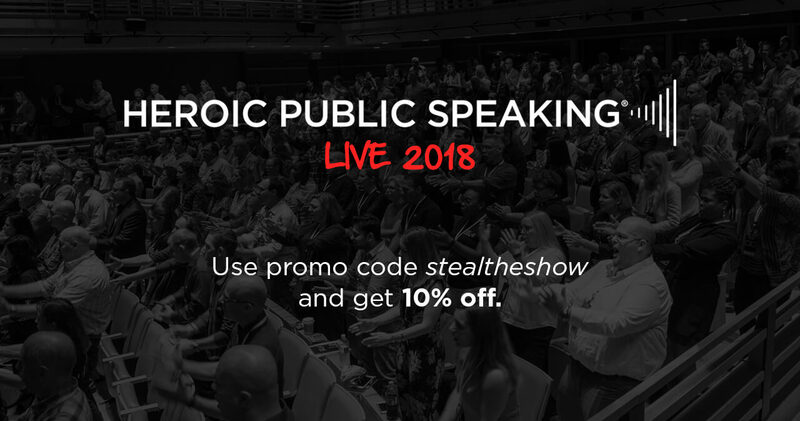 One of the ones that I used in a presentation at Influence, the NSA Convention this summer, on talk triggers for speakers – so this topic is very fresh in my mind – sometimes the best talk triggers for speakers aren’t necessarily on the platform, but it’s how you’re running your business around the platform. So, for example, what you do for thank you gifts, right? Do you do something that’s actually talkable and memorable, or are you doing something perfunctory. Like, “Oh, great, I got some pears.” One of my favourite examples, and I hope that your amazing team, Michael, will hook this up in the show notes. Jessica Pettitt who was an extraordinary speaker on social justice and related issues has one of my favourite talk triggers in the speaking business. When you submit the ‘contact us’ form, on her website, you get an autoresponder with at link to a video. And the video is not her trailer, the video is not her saying, “Geeze, I can’t wait to work with you.” The video is a detailed, five-minute showcase of her showing you how to fold a fitted bedsheet, because folding fitted bedsheets is very, very complex, people just sort of pile them up, and she has an amazing system for folding it, like military grade. And so, she shows you exactly how to do it, and then the subtext at the end is, “You’ve just seen her fold a fitted sheet. Imagine what she can do for your audience. Make sure you hire Jess Pettitt.” It is genius. 23:02 Michael Port: That’s actually brilliant. That’s very, very clever. So, that’s something that, obviously, is repeatable, because it’s automated, it’s incredibly effective. Let’s go back to the gifts, for a second, because this is something that most speakers do some form of; a thank you note, a gift, as weak as just an e-mail, all the way up to a framed portrait of the person’s family and gold lettering or something. But the thing about gifts, that seems like it may be difficult to really effect in the model that you’ve introduced, is that, if gifts are always the same, they become, often, less relevant. So, someone came up to me the other day when I was at this event thing, wanted to give me a gift of these essential oils. Now there’s no way they know anything about me at all, if they’re going to give me a gift of essential oils, because both of you guys know that I’m allergic to garlic, perfume, and certain other smells. So, if you walked in with a whole bunch of cologne, I send you home and you shower. There’s a talk trigger for you! So, that worked against him, meaning, it demonstrated that it was something that is being repeated and is not relevant. So, how do you reconcile doing something afterwards, that is some sort of gift, and make it into a talk trigger so that it’s repeatable in some sort of consistent way? 24:39 Daniel Lemin: One of the things we do, this is actually not on the speaking side, or the consulting side, but you could do it, and probably we should do it on the speaking side. When we get a new consulting client and we’re going through the on-boarding process with them, “Tell us all about your business. Tell us all about your pains and your frustrations,” we have a question that’s actually a little form that they fill out to give us some of that information. And so, they choose one of the pictures, and keep going, complete the form, and then, what we do with that, during the first call with them, because we’re a virtual consultancy, we don’t actually, for the most part, ever show up for that call, we send them a care package containing that snack. So, we at least know that they like trail mix, or potato chips, or popcorn. So, we send them a reasonably personalised little gift, just as a little bit of a lubricant for conversation during that sometimes very long intake call. So, a simple thing. 25:47 Michael Port: Interesting! And you’ve done this after they’ve already become a client? Or during the sales process? 25:53 Daniel Lemin: It’s just after they’ve signed up, yeah. 25:55 Michael Port: Oh, great! So, you figured out a way, there, to use food in a way that doesn’t make any assumptions. Is there a box they can say, “None of the above”? Can they opt out in some ways? 26:31 Jay Baer: We’ve got people, we could make that happen. 26:34 Michael Port: Or, you could do, instead of a food thing, say, “Oh, don’t like these? What’s your favourite X?” or, “Which do you like better? These colours or these colours?” and then you send them this little picture with those colours. I don’t know I’m just throwing out ideas. And for the meeting we send in some sort of appropriate livestock. That’s a talk trigger, right? Now you’ve got live video! 27:07 Michael Port: I’ve thought about doing singing telegrams. But I wouldn’t – we work with Disney – I don’t see sending a gorilla, someone dressed as a gorilla to Disney Imagineering and then try to get them through security. It wouldn’t be appropriate. 27:58 Daniel Lemin: Well, having been on the receiving end of a so-called singing telegram, I can tell you they are not always the best user experience. I thought that the guy who came to sing to me had just been released from prison. So, mileage may vary, depending on who you get to sing. 28:17 Jay Baer: But, you know, Michael, this whole concept of what is the talk trigger, merits talking about how we explore that in the book. And the idea is, you come up with a number of candidate triggers and, usually, it’s five to eight, or so, depending on your business, and those candidate triggers are based on your examination of what customers expect and then determining what you can do that they don’t expect, i.e. singing telegram. Well, now you’ve got a pile of five to eight ideas that you know people don’t expect, and then you have to figure out, well, which of these do you actually do? So, Daniel actually created this amazing concept, which is called a viability matrix, and so the idea is that we look at how presumably talkable is the idea? So, singing telegram is more talkable than cookies and milk. It just is, right? And so you can stipulate to that. So the X axis is talkability, and the Y axis is operational difficulty, right? So, singing telegram is also way harder to do than cookies and milk, because you have to write a song every time. So you have to say, “Okay, do we want to get into water that’s that deep?” And so you matrix all of your ideas on talkability vs operational complexity, and then our recommendation is that you shoot for one that’s kind of in the middle. Sort of halfway talkable and halfway difficult, and then you test it. So you say, “Okay, we’re going to roll this out to every n’th customer,” or, “In one location,” or, “Only for particular types of events,” or, “Only on Thursdays,” or however you want to segment your business, and then you measure the downstream effectiveness of that talk trigger. Do people mention it? Do you see evidence of talkability? Is it showing up in social media? Et cetera, et cetera, and then, if you’ve got evidence of it, then you roll it out to the whole business. 30:01 Michael Port: Hmm. Very interesting. Very interesting. You know, I think one of the things that people really appreciate is these kinds of tools. A lot of books are written and they will introduce the concept, but they don’t often offer specific tools that can be used to take that concept, which now they have a context for, but then actually apply it. So, that was one of the things I was wondering. I was thinking, “Well, if I had brought this as a conversation to my team, we’d go in circles.” Because people would argue for their favourite, and then we’d come up with another one and it would take s down some other path. But if we had this matrix to work through, then it gives us something very practical to use, to make sure that we’re running it through these criteria very well. 30:59 Jay Baer: Well, to some degree, that’s why this book exists, Michael, because there are a number of good books on word of mouth out there, so it’s not as if nobody has ever said word of mouth is important for your business. That’s been said for a long time. What we have done, is modernised it a little bit in this social media world that we live in, but more importantly, given everybody out there, whether you’re an individual speaker or a small business or a giant corporation, an exact process that you can and, in our estimation, should use, to create, measure, test, and implement your own talk trigger. So we’ve operationalised word of mouth in a way that it hasn’t been done historically. And if we ever have a contribution to the field, I think that’s what it will be. To that end, if you’ll allow me, Daniel and I have created a six step process document. So, in addition to the book, which has a lot more detail, of course, we have a little mini-guide to this six-step process that you use to create a talk trigger, that we’re delighted to give listeners for free. And if you go to talktriggers.com/sts, you can download that for free. That is our gift to you. We hope that you will do it, because we desperately want everybody listening to put this kind of word of mouth differentiator into practice in their own business. 32:10 Michael Port: Fantastic! And we’ll also include that in the show notes, of course. So, let’s talk about the performance of the talk trigger. So, it’s one thing to make the cookies, and have them sitting out in a bowl. And it’s another thing to present them in a way that actually creates that warmth and human connection between the person giving them the cooking and the person receiving the cookie. And so, one of the things that it often challenging to scale, for larger organisations, is aspects of human interaction. They can say, “Listen, everybody, you can operationalise eight cookies to be sitting in this bowl by this time, they need to be at this exact temperature,” et cetera, but operationalising interactions is more difficult. So, do you have any research, empirical or anecdotal, that helps us understand how, A, to make sure that the performance aspect of that talk trigger is really compelling and also then, how do we scale it and teach other people how to do it? 33:21 Jay Baer: Yeah, you’re absolutely right. Some talk triggers can be experienced in absentia, right? Without a customer being present, or a team member being present. You sort of just get access to it. One of our best examples is Uber Conference, the free conference calling service. Their on hold music is hilarious. It is absolutely side splitting! Now, they don’t need a person to hand that off to you, right? You can experience the talk trigger without having somebody hand it to you. But in most cases, especially high touch businesses or businesses that have a front door; retail, restaurants, et cetera; it is absolutely critical that the performance is dialled in, and it really does come down to training. So, perhaps our favourite example of this in practice, Michael, is from a restaurant in Sacramento, California, called Skip’s Kitchen. And Skip’s is a counter service restaurant, so you go to the front and you say, “I want two patty melts and I want an order of onion rings and a chocolate shake,” and when your food’s ready they bring it to your table. Pretty simple. But here’s the thing. Skip’s has now been in business for ten years. They’ve spent a grand total of zero dollars and zero cents on advertising, in the history of the business. They were just named the 29th best hamburger restaurant in America by USA Today newspaper, despite never having been advertised, and it’s possible because of their talk trigger. So, the way it works is, you order at the counter. Before you give you money or your credit card, from underneath the counter, they whip out a deck of cards and they fan the cards out, face down, in front of you. And they say, “Pick a card,” and you select a card. And if you get a joker, your entire meal is free, whether you’ve ordered for yourself or an entire soccer team. Now, on average, three people a day win. And when they win, they go crazy! They’re taking patty melt selfies and they’re doing live Instagram videos and writing Yelp reviews and crying and calling their mom and a high school marching band comes out and plays a song. I mean, it’s a whole hullaballoo. So you don’t have to win, you just have to be given the chance to win, to tell the story. And it’s so effective, A, they don’t advertise; B, there’s a line to get in almost every day; C, in Sacramento, despite the fact that they have a giant neon sign out front that says Skip’s Kitchen, in Sacramento, most people call it, “That joker restaurant.” That’s a good talk trigger. Now, it only works, because, A, it’s unexpected, B, it’s repeatable, not just ladies’ night, not just on your birthday, everybody gets a chance to play the game, but, C, the people who work the counter are trained on the performance. It has to be done at the right time, it has to be done with the right pacing, it has to be done with the right inflection. It can’t just be sort of haphazard, “Oh, yeah. Pick a card.” Right? If it’s just perfunctory, it doesn’t work. It has to be done with the requisite amount of drama and intention, so that the stakes feel higher than a patty melt. And their owner, Skip – and I think it helps in this respect, because it is a family owned business – is able to work with his team to make sure that that experience is delivered the same way every time. The other thing which I love, which is not really a talk trigger, but it’s just a great aspect of their business, they have incredible Tee-shirts, and the Tee-shirts are free, but only if your name is actually Skip. So, if you come in with a driver’s licence and your name is Skip, you get a free shirt. Other than that, you’re not allowed to have one. 36:49 Michael Port: That is brilliant! And, you know, it’s interesting because, my name is not Skip, I have absolutely no issue with Skip for not making a Tee-shirt available to me for free. Because I couldn’t be Skip, it’s not possible to be Skip. So, he’s not taking something away from me that I could have had. And I think there’s something really interesting in this example, because one of the concerns that you addressed earlier was, well, A, if the talk trigger is unreasonable, then it doesn’t really work and, B, you could potentially highlight your policies in a negative light as a result of doing something that would override your policies. In this case, however, when someone gets a joker and they get it for free, their meal for free, of course it’s overriding the policy that you would pay for your food. But the policy of paying for your food is not specific to this restaurant. Skip is not the only one who charges for food. Every restaurant charges for food. So you don’t have any expectation of getting food for free, when you go to that restaurant. So, when they override their policy of making you pay for it, you’re not angry at them, because now you have to pay for it. And he said, sometimes, literally someone will come in and there’s twelve people with him. One person orders for the whole group and they win and it costs them a fair amount of money. But it’s the only advertising he does. But, from a story standpoint, and again, I want to emphasise, that talk triggers are all about giving your customers a consistent story to tell. The greatest way to grow any business, whether you’re a speaker, a small business, a restaurant, or a corporation, is for your customers to tell that story over and over and over. And so, we tend to overcomplicate the story, or festoon it with circumstances and conditions and the best way to do it is to say, “If this then that,” because nobody cares about your business the way you do, and so they’re not going to parse through all your exceptions and circumstances. Just give them a clean story to tell, and they’ll tell it. 39:20 Michael Port: Yeah. In fact, actual stories that you tell in your speeches, as a speaker, often become talk triggers. And if you overcomplicate a story, or include too much exposition, or the resolution isn’t crystal clear and easy to introduce, and if you’re telling a moral, if the moral is a little murky or hard to understand, then it’s very hard for someone else to go home and tell that story to their friends and family. But if you do it really, really well, many people in that audience are going to go home and tell the same story or stories that you told. And then they’re going to tell someone else and that person’s going to tell someone else, and most of the time they’ll attribute it to you on the first retell. After that, who cares? But on the first retell, they go, “Oh! I just listened to this speech with Jay Baer! It was so good, he told this story about X,” and then you now become part of their life outside of the space. And if it’s too complicated, it’s very, very hard to retell. 40:23 Jay Baer: I think what you said about exposition could not be more true. I’m guilty of that as well, because many speakers are afflicted with the curse of expertise and you want to be sure that you tell the story thoroughly, and you want to make sure that people follow you. But the really interesting point about that is, it’s very counter intuitive. The more you tell about the story, they less they understand. You think that, “Let me make sure, and add every detail so that you can see this tableau of what has happened,” and it actually works the exact opposite of how you think it’s working. 40:52 Michael Port: Yeah. One of the things that folks like us are often very stimulated by is context. We love to understand how thing fit together, how the world works, how, when you move something on the left side, it changes something on the right side. And most writers, speakers, thought leader types, are like that, and so, they can sometimes fall into the mode of overcomplicating the stories or examples that they give, because they understand and they see how all the tentacles interact or integrate or move into other areas, and they want to make sure that you understand all of those things. But, in fact, in that particular time, all of that other context might not actually be important. And if we’re super, super clear on what we’re trying to accomplish with that story, then we cut everything that we don’t need, once we’ve accomplished that thing. 1:50 Daniel Lemin: Yeah. I remember one of the, Michael, when I spent some time with you at Heroic Public Speaking, you may remember Julian Mather. He’s an amazing magician from Australia. And one of the most interesting things, I’ve actually started following him, because I really think he has a great message. I’m one of those people. I think the three of us are probably among that group, but the vast majority of people just want to be amazed, or they just want to, like, “Wow! That’s really cool! That’s a really cool trick!” and that’s it. 42:49 Michael Port: Yeah, it’s a really important point that you make, Daniel, because we are, very often, not our audience. And one of the biggest mistakes that we make is to try to produce something that we would like. Because what I want to experience may be very different from what most of the audience wants to experience, and what they want to know, or need to know. And so, I will often go watch speakers who do things that don’t resonate with me, that do resonate with the audience, to try to understand why. And then, if I can understand why, well then it helps me, A, understand the audience more, and, B, understand how I can find ways to serve them in a way that I think is potentially more effective, but that is within my own style and what I enjoy about the work. And each one of us should be doing that, I think, on a regular basis. Have you, as speakers, found something similar? 43:55 Jay Baer: Yeah, not only do we find something similar, as speakers, by even as authors. We certainly expect that many people will find value in this book. We hope that will be the case. But we know that not everybody will. And that’s true. Daniel and I will buy you any book that you want, regardless of cost, if you don’t like Talk Triggers. There’s 100% money back guarantee, which you don’t see in a book very often, but we know that somebody isn’t going to like it. And we want to make sure we’ve got them covered. That’s our talk trigger, for the book, ‘Talk Triggers’. 44:46 Michael Port: I love it! It’s fantastic! And, listen, guys, I have to say, I want to point something out, as we wrap up here, for the audience. One of the things that both of these gentlemen have done in this book and consistently do in all of the books that they work on, is give you example after example after example after example. You’ll notice, any time I asked a question, they had an example. Ready to go. And that example illustrated the concept more easily than if they just gave us the concept and expected us to be able to remember all the concepts over this long period of time. And so, speakers and authors, when you’re working on your material, both Jay and Daniel are people to watch and to emulate, because they are so focussed on researching examples for every single idea that they introduce, and every concept that they introduce, to make the experience full for the reader or the audience members. So, thank you for doing that, guys. Is that something that you always did from the beginning, or learned, or, really, adapted over time as you learned of its importance? 45:57 Daniel Lemin: Learned over time for sure, but we actually have taken it to a sort of logical extreme, because both of us are doing Talk Triggers workshops and keynotes, et cetera, and obviously the book, and podcasts like this. We actually have a shared Google Doc, where we have all of the stories in the book, and then many others that we have discovered since we finished writing the book. Like, I’m doing a B2B talk next week, all B2B. So, instead of the locksmith, I go to the database of stories and swap out the different one, which is more a B2B version of that same tale. So, as we add more and more and more examples, it just makes it so much easier to keep everything you say hyper relevant to the audience. Which, after all, as you say, relevance is the killer rap. 46:57 Jay Baer: Yeah, and kind of one of the fun things that I find about this concept about the book, Talk Triggers, but just about the concept itself, once you kind of read it and have digested it, you start seeing them everywhere. And you don’t realise how subtle they really are, but you start seeing them. So, we’ve been trying to document those, because, I mean, they’re always worth talking about. They’re always worth up-levelling as an example. 47:20 Michael Port: That’s fantastic! It is is true, and that is the importance of learning. Because, very often, we don’t even know what we need to know, but once we discover what we need to know, then we actually see that out in the world. And, of course, I’m sure everyone’s familiar with the reticular activating system, you know, you’ve never seen a car before, you see it at the dealer, you like it, now, all of a sudden, you see it everywhere. It’s the same concept. But we want to make sure that what we’re seeing is what we need to be seeing, as it relates to the goals that we have, where we’re trying to go. And so, I love that this is something that you’re seeing all over the place. And, for a business owner like myself, who is working on rapidly scaling the organisation, this concept of talk triggers, is extremely important and extremely valuable and just the work we’ve done today gives me the opportunity to now see more of that out in the world and, as a result, hopefully improve my business in the process. So, thank you so much, gentlemen! I think I’d like everyone to know where they can find you individually, as well as collectively. 48:30 Jay Baer: I was going to just tell you the book’s website is talktriggers.com and as we mentioned, the special landing page for listeners, talktriggers.com/sts, with a free download and all kinds of fun stuff, including alpacas. 48:41 Michael Port: Fantastic! And is Jay Baer a place they can go to see all of your work, and other books? 48:46 Jay Baer: Yeah, Jay Baer is the place to go for all my stuff and convinceandconvert.com, of course, is our corporate site, with all of our information on marketing and customer experience, and podcasts and all that stuff. 48:57 Daniel Lemin: And, yeah, very similarly for me, @daniellemin, or, I guess, “Danielle Min”, if you get it the other way, you can find me at Twitter and elsewhere. 49:09 Michael Port: That’s great! Hey, guys, thank you so much, and Jay, by the way, congratulations, once again, on making it into the Speaker Hall of Fame, for the National Speakers Association. It’s quite an accomplishment, and we’re all very, very proud of you. 9:24 Jay Baer: Thanks, my friend. I literally could not have done it without you and your fantastic wife, and everybody at Heroic Public Speaking, so thank you! 49:29 Michael Port: Fantastic! Bye, guys! Talk to you soon! 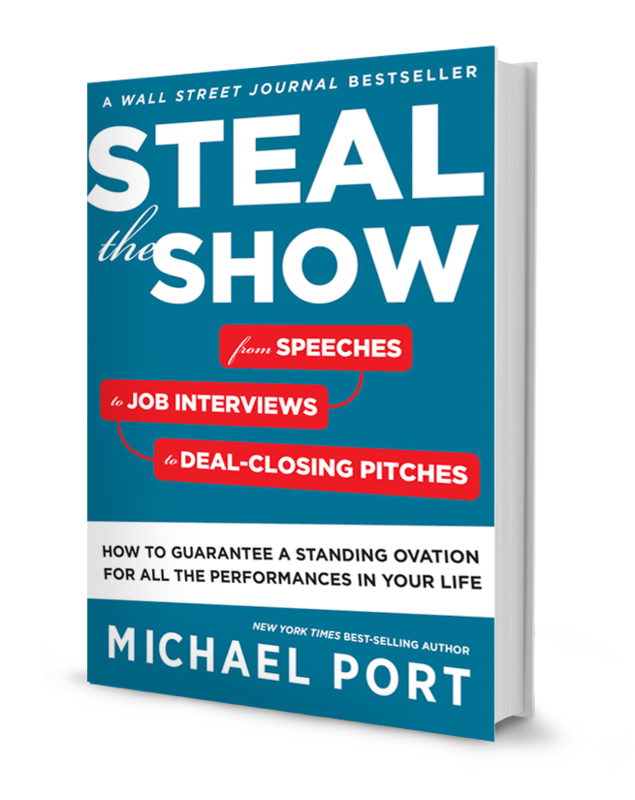 Thank you for listening to Steal The Show, with Michael Port. I’m your host, Michael Port. This podcast was produced by Laura Bernstein, our director of communications, with sound production and marketing by Kast Media. Music is mixed by Shammy Dee and we recorded today’s episode at Heroic Public Speaking HQ, the most impressive public speaking facility in Lambertville, New Jersey and, perhaps, the world. Special thanks to our guests, and to you, for listening and learning how to become a performer in your spotlight moments. Make sure to reach out to us on Instagram and Facebook, @heroicpublicspeaking, and leave us a review on iTunes, if you like the show. And rate it. If you like the show. Oh, and make sure to visit heroicpublicspeaking.com/live to come to the event, October 1, 2, and 3, in Philly. Enter the promo code, stealtheshow, all lower case, all one word, and you’ll get 10% off your ticket price. I love you very much, and not in a weird way, but I love you for being the big thinker that you are, and standing in the service of others, as you stand in the service of your destiny. Bye for now.